This Guest Review was written by our goods friend Rob Kalajian! He runs the board game website Pawn’s Perspective! You should definitely check it out! What would happen if you took an older 16-bit Action RPG, oh, let’s say Zelda: A Link to the Past, crossed it with The Princess Bride, and released it on a modern day system? 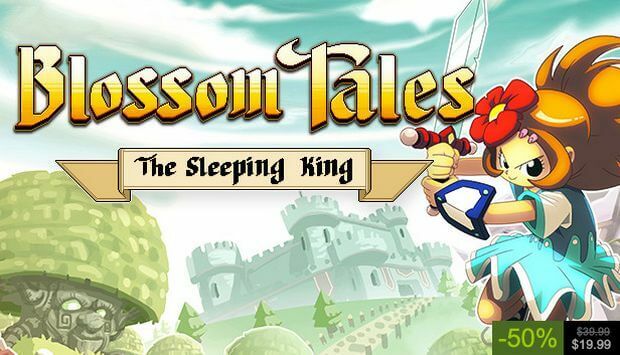 Blossom Tales: The Sleeping King. That’s what. When I bring up a Link to the Past, it’s not just for comparison sake. Blossom Tales plays like a love song to the classic SNES title. It’s a retro gaming lover’s dream, even if it’s a short one. If you’re familiar with Zelda: A Link to the Past, or top-down action-RPGs in general, then you know what to expect from Blossom Tales. Players take control of Lily, Knight of the Rose, trying to save her king and kingdom from a dark wizard. You’ve got a sword, shield, and special items to help get Lily through all sorts of puzzles and other sticky situations. One major difference here is that unlike most similar titles that may limit your supply of arrows, bombs, etc…, Blossom Tales doesn’t. Instead, you’ve got a Special Meter that depletes as these items are used. One that recharges rapidly. It gives the game a bit more of a fast-paced feel than those that have come before it. I mentioned The Princess Bride before. That reference mostly comes from the fact that Blossom Tales is a story being told to two children by their grandfather. As he tells the story the children often interrupt him, arguing with his storytelling technique and offering the player choices on how to change the story in tiny ways. It’s a really cool mechanic, but one that’s a tad underutilized. That brings us to the first gripe with the game. The whole idea of the grandfather telling his grandchildren a story that they influence is excellent. The choices given, however, really have a very little effect on the story as a whole. I would have loved to see the choices made have a bit more control over what happens in the game, possibly opening different dungeons or providing the player with some sort of different item or power that they couldn’t have gotten otherwise. The next issue with the game is its length. You’re only getting a handful of dungeons – four to be exact. The entire game rounds out to about 15 hours of gameplay. This isn’t necessarily a bad thing for the younger gamers in a household, but for those of us who grew up on similar titles, it’s a bit short and straightforward. There are no real story twists that change the world or shake up the main objective. Putting those two minor complaints aside, Blossom Tales is smooth, polished, and a blast to play. It’s family friendly, and while the game is based on combat there’s nothing explicit here. The game safely falls in its E10+ rating and can be enjoyed by younger players as long as they have the ability to read. While the game certainly feels like it’s aimed at fans of old Zelda games, it certainly has an appeal to new players with it’s colorful, retro styles and approachable gameplay. Blossom Tales is available on both Steam and the Nintendo Switch at a price of $14.99. There’s really no excuse to pass up on this one. My preference would be the Switch version since it makes it easy to take the game on the go, but both the Switch version and Steam version are identical. FCC Disclosure: A Switch code was provided gratis for this review.